Maja Köberl is co-founder and Head of marketing at Voxos based in London, United Kingdom. Maja is a 20-year old German-Austrian with a background in Marketing and Business. She worked with the founders to develop the product and launch strategy within the organization. Using her know-how in digital marketing and business skills, Maja is responsible for designing and executing Voxos’ launch strategy. Maja’s passion lies in developing ideas into products that can have a positive life-changing impact. What is the idea behind Voxos and how did you come up with it? Voxos is a pair of smart glasses with integrated bone conduction technology, which enables the user to access all digital information from their mobile device with their glasses via sound technology. Basically, the user can listen to music, get GPS directions, take a phone call, use voice control and much more without ever pulling out their phone. We developed this product, because we realized the ever growing necessity of staying connected can become a huge risk in our everyday situations. Whether it is driving, cycling, walking or something else, staying connected on the go is always a form of distraction. The use of in-ear headphones does not allow us to react to our surroundings. I had one personal experience, which really convinced me that we need a solution for this dominant issue. A few months ago a woman next to me got hit by a train, because she was using headphones to listen to music and could not hear the horn of the approaching train. The train hit her and I am not sure if she survived. This woman was not able to hear what was going on around her. 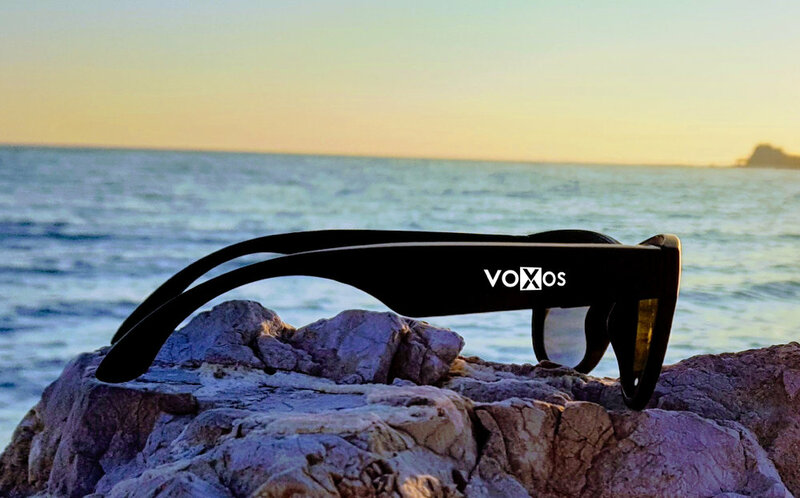 Voxos Smart Glasses let you listen to music, but leave the ears completely free, so you can be present in your real and digital world simultaneously. The project started about a year ago and we are a team of about 7 people. To be honest, I was very lucky. I finished my A levels in Austria at the age of 19 and moved to London to join a tech company. All this happened one year ago. Now I am 20 years old and got the chance to become a big part of this amazing project, Voxos Smart Glasses. I worked really hard over the last year and also during my business college in Austria. I am very happy that hard work always pays off, no matter if you have a degree or not. As the technology is super new and unique, it requires a lot of education. Doing this online and trying to get the right message across to the user immediately is definitely not the easiest task, but I think we manage it very well. Breaking the educational circle and deciding not to go to university just yet. I wanted to gain practical experience and now I am where I am, which is great. Sometimes people are surprised about my age. :) Also, if there is not a lot of competition this has good and bad sides for an entrepreneur. Making people aware of the solution we are providing and not only the end-customer, but everyone, lies in your hands. Especially in the niche we are in, which is bone conduction technology, a lot of education of the market is needed first. Being a female entrepreneur is great in my opinion. I’ve noticed that there is a lot of support for female entrepreneurs, especially in London and I am a huge supporter of the WoW Women. It definitely is! Have you ever been to a technology related event or trade show and had to wait for the ladies’ bathrooms? No? Me neither, and that is a sign to me that there are not enough ladies in the industry. I mean, that would never happen at a concert or in a bar, right? Don’t worry too much about what other people think of you, reach for the stars! I think the main focus of the trends in health tech will be reducing time and costs + being more efficient. Who are your inspirational women in health tech? Carla Brenner and Aditi Deeg (Healthtech Women) are my two!